The publication contributed the article to Space.com's Expert Voices: Op-Ed & Insights. Mr. Speaker, global temperatures stopped rising 10 years ago. Global temperature changes when they exist correlate with Sun output and ocean cycles. During the Medieval Warm Period, from 800 to 1300 AD, long before cars, power plants, or the Industrial Revolution, temperatures were warmer than today. During the Little Ice Age, from 1300 to 1900 AD, temperatures were cooler. Neither of these periods were caused by any human activity. Even climate change alarmists admit that the number of hurricanes hitting the U.S. and the number of tornado touchdowns have been on a slow decline for over a hundred years. But here's what we absolutely know: We know that Oklahoma will have tornadoes when the cold jet stream meets the warm Gulf air. And we also know that this president spends 30 times as much money on global warming research as he does on weather forecasting and warning. This single, misleading statement, spoken in the wake of a deadly, devastating tornado outbreak in Oklahoma, was crafted with truths and mistruths. Perhaps it was uttered out of genuine misunderstanding of the scientific evidence on manmade climate change? Perhaps it was said out of ideological-driven political expediency? Regardless, it earned Bridenstine the brand of "climate denier," an indelible mark that has been with him ever since, and made his recent confirmation as NASA administrator one of the most dramatic and controversial ever, for why should a science denier lead one of the world's leading scientific institutions? But now, just six weeks into his tenure as NASA administrator, Bridenstine stated that he has "evolved" on climate change. "I don't deny the consensus," Bridenstine said at a NASA town hall meeting. "I believe fully in climate change and that we human beings are contributing to it in a major way." When asked why he changed his mind, Bridenstine told The Washington Post, "I heard a lot of experts, and I read a lot. I came to the conclusion myself that carbon dioxide is a greenhouse gas, that we've put a lot of it into the atmosphere, and therefore we have contributed to the global warming that we've seen." 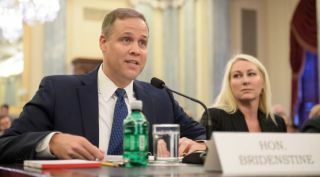 "We spend over $100 million dollars annually … on carbon monitoring at NASA," Bridenstine told a small group of reporters at NASA's Washington D.C. headquarters. "We're committed to that. And I'm committed to that." Bridenstine's apparently genuine coming around to the facts of climate change is commendable and makes him a scientific hero of sorts. Too many scientific issues, most notably GMOs and climate change, are viewed through the lens of ideology. It's refreshing to see a politician publicly change his mind to move in line with scientific evidence. As Bridenstine has apparently shirked off his ideological blindfold, one wonders if his detractors will as well? A great many left-leaning scientists, science communicators, and politicians incessantly railed against Bridenstine during his protracted confirmation process, accusing him of climate change heresy and of lacking a background in science, despite the fact that one of NASA's greatest administrators, James Webb (who now has a telescope named after him), had even less relevant experience than Bridenstine. Bridenstine served as a pilot in the Navy and later was the executive director of the Tulsa Air and Space Museum. Some of Bridenstine's critics even turned on liberal favorite Bill Nye when he accompanied Bridenstine to Trump's State of the Union. One writer even lambasted Nye simply for congratulating Bridenstine when he was confirmed in April. Their bias and their message was clear: Don't engage with people with whom you disagree. Nye, who notably changed his mind on GMOs in 2016 (he's now proudly pro-GMO), wisely didn't listen. It's possible he even helped persuade Bridenstine to accept the scientific evidence on climate change. Jim Bridenstine's public acknowledgement of manmade climate change is a stirring example of how science transcends ideology. His actions should be celebrated and replicated. Originally published on RealClearScience. Follow all of the Expert Voices issues and debates — and become part of the discussion — on Facebook, Twitter and Google +. The views expressed are those of the author and do not necessarily reflect the views of the publisher. This version of the article was published on Space.com.